C Program to calculate the Volume of a Cube – In this particular article, we will detail in on the methods to evaluate the volume of a cube in C programming. Several examples and sample programs have been added to this blog post as well for you. The compiler has been added for the execution of the programs. As we all know, the cube is a universally used three-dimensional figure. 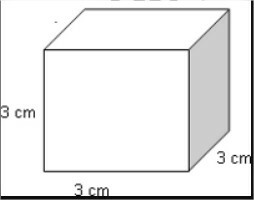 A cube is a square extrapolated from to give it a height which is similar to the sides as well. Volume = 3^3 = 27 cm^3. 1)The value of side of a cube will store into the variable “side”. 2)The value will be substituted into the formula area=side*side*side. 3)The calculated value will store into the variable “area”, and displayed using printfunction. 1)The formula for the area of a cube is a=s*s*s.
area(float s) is called function. 3)Then function float area(float s) return the calculated value, and that value will store into variable “s”. 1)Here *s,*v are pointer variables. 2)We are calling the function using area(&s,&v) by passing addresses of s,v. 3)The function void area(float *s,float *v) calculate the area ,that area value will store into the variable “v”.That v value will be displayed using printf statement. 2)area(s)replaced with that expression given at #define.